For awhile after I started food writing, there was a point where I had let go of all physical activity. At some point, I felt the repercussions, and decided to give the Pilates studio a few blocks away from my new Hollywood apartment a go. I had an inkling that I’d like Pilates, but I ended up really loving it. I’ve gone through the distance running, Bikram yoga, Anusara-influenced yoga and spin phases in my child through adult life, but I found Pilates to be just what I needed, because I really need consistent strength training – especially since I’ve had shoulder surgery and am now perpetually conscious of it and my upper body strength. I have also found my prior yoga training really helpful for proper form while I’m on the reformer, and now whenever I’m not even in the studio, I love the extra attention I subconsciously pay to my posture, even while at the desk. In short, I highly recommend Pilates! How long ago did you start Pilates Platinum? 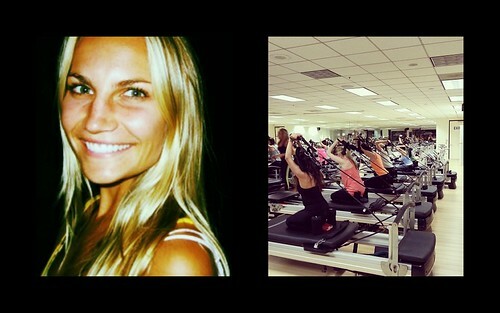 I started Pilates Platinum six years ago at my Hollywood location. Since then, I have expanded west, opening Brentwood, Venice, and Santa Monica studios. How have your eating habits evolved since you first started practicing Pilates? My eating habits have definitely changed drastically over the past ten years. I had an eating disorder for many years and with that comes a very unhealthy diet mentality. I feared certain foods that I’ve since learned are good for me such as avocado, oil, nuts…even chocolate!! I knew a lot about exercise and physical fitness, but I didn’t really know much about diet. I began reading and researching everything I could find on the topic and started practicing clean eating. I was shocked by the difference I noticed inside and out as I looked and felt better than ever. My skin had a healthy glow, my nails became stronger, and my hair became shinier and thicker. That was more than enough incentive to maintain my new healthy eating habits. I know it’s unrealistic to deprive myself of foods that might not be the healthiest for us, such as cookies, but I really do believe that moderation is key. The benefit of maintaining an overall healthy eating habit is that your taste buds actually do change and you lose a lot of the cravings for the “bad” stuff. Now, if I have a cookie, I can have a bite or two and be satisfied as I find it to be super sweet. As far as diet rules go, I try to stay away from rules as they seem to just make me want what I can’t have even more. I will say, however, I do try to eat throughout my day so that I’m never “starving.” I find that when my blood sugar gets too low, I make poor diet decisions. Do you have a favorite place you like to eat? What is it – and what do you like to order there? How about places you like to indulge? Sushi and Italian foods are my favorites. I have a lot of restaurants in LA that I love so it’s hard to pick just one. I definitely frequent Jinpachi which is a little hidden gem. They have sashimi of all sorts and it’s always fresh and delicious. When it’s time to really indulge, Madeo is one of my favorites. It’s some of the best pasta and pizza I’ve ever had. My classic poison is a nice glass of pinot noir. A new favorite of mine, however, is called the Eboost pick-me-up. It consists of two ounces of EBOOST super berry shot, coconut water, and 1.75 ounces of vanilla-flavored vodka. It’s quite tasty! I got this trail mix for Christmas these past holidays, and it was so good – from Trader Joe’s! But then I realized it was the best trail mix I’ve ever had, because it had chocolate chips in it! Isn’t that cheating? What’s your take? Nuts and dried fruit trail mix is obviously a healthy choice, right? WRONG! While plain, natural mixes of unsalted nuts and unsweetened dried fruits can make for a good portion-controlled, high-energy snack, many mixes throw in chocolate chips, loads of salt, and added sugars. Since a small handful easily contains 300 or more calories, read your labels closely! Your best bet is to make your own trail mix at home and measure out the portions. A handful here and a handful there can add up to hundreds or even thousands of calories very quickly and easily. There is nothing wrong with some nuts and dried fruit, but make sure you know what else has been added to the mix. We’ve all have been seeing juice cleanses in our social media feeds lately, especially since the start of the new year. What’s your experience with juice cleanses? Juice cleanses aren’t really for me. I drink juices each day for the nutrients but I enjoy chewing my food and the juice cleanses make me feel too deprived. So I would have to say that it depends on the person and what he/she is trying to achieve. It’s good to give your digestive system a break from time to time, but I’m not sure the cleanses are that effective for weight loss and sometimes it can be counterproductive if the person feels he/she is being deprived of food. This entry was posted in Brentwood, Hollywood, L.A., Santa Monica, Venice and tagged Brentwood, exercise, fitness, Heather Dorak, Hollywood, interview, los angeles, Pilates, Pilates Platinum, reformer, Santa Monica, strengthening, Venice, workout. Bookmark the permalink.